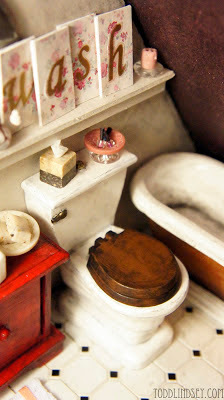 Domer Home: Dollhouse Bathroom Reveal! 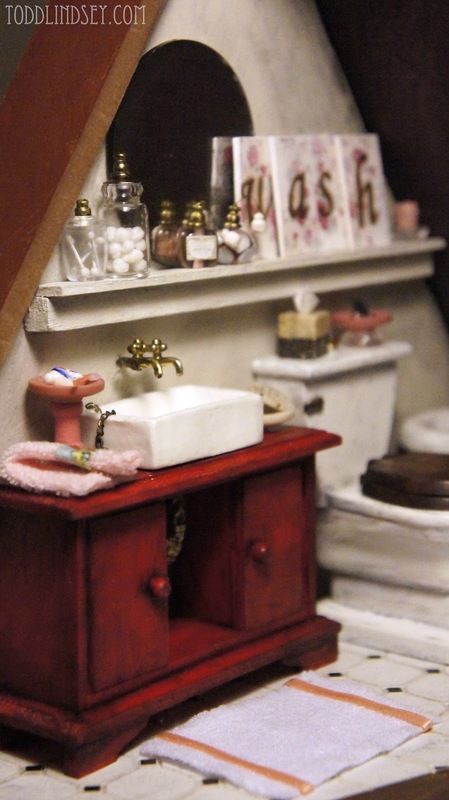 I just looovvveee how you can renovate and redecorate a full bathroom for basically pocket change... when you do it on a 1:12 scale. 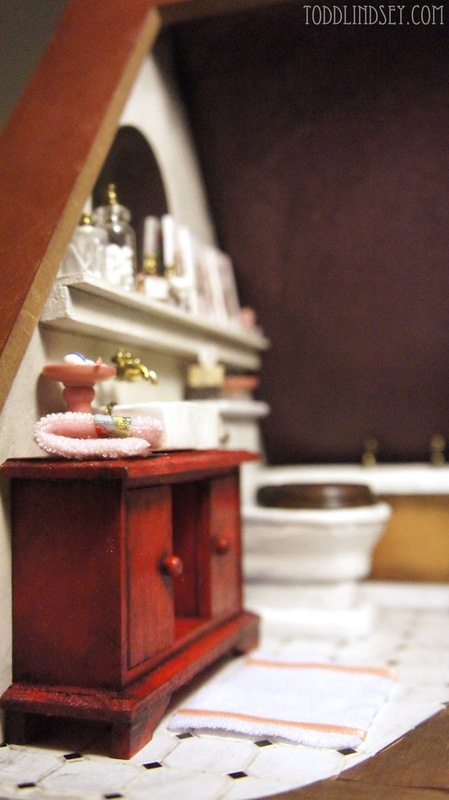 (For a human sized bathroom reno, stay tuned later this summer!) 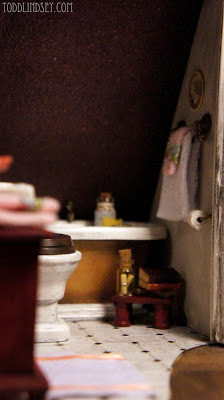 Here are a few shots entering the bathroom. I think I need to make some sort of wall screen to separate the bath from the bedroom right next door. 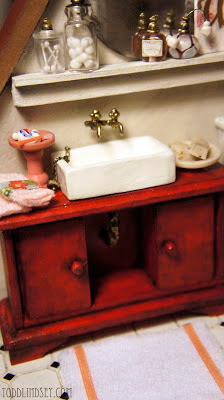 The red vanity was made from a Michael's hutch for $1. You can read about that project here. 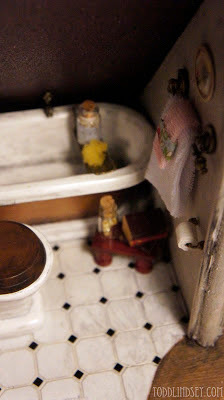 My favorite part is the plumbing under the sink. You will have to check out the original post to see what it's made of! The plug for the sink drain actually fits the drain hole too. Cute, right? 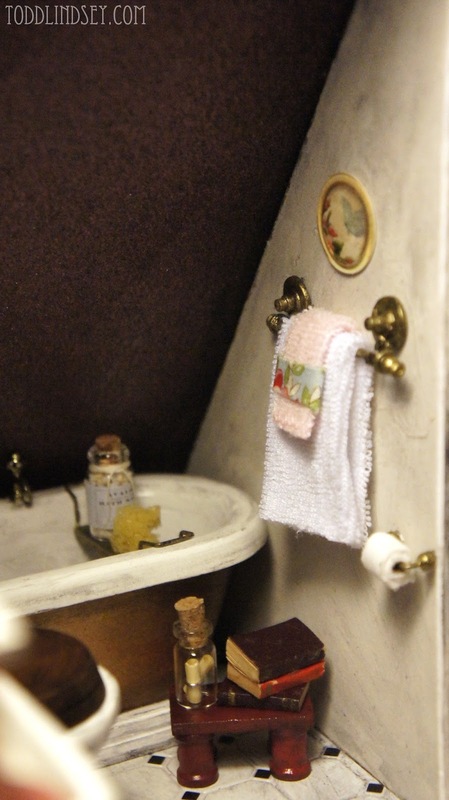 All the towels are made from dollar store baby washcloths. 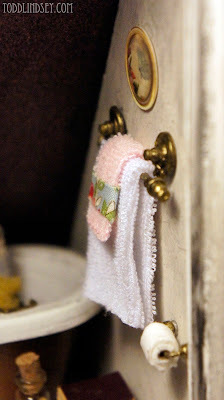 I just added some printed fabric to the hand towels to make them a bit more fun and colorful. The rug is also made from the same washcloths; I just added some thin ribbon as a trim. 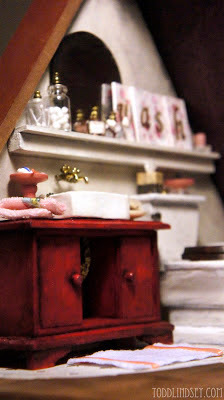 The toothpaste and toothbrush I made from polymer clay and the stand holding them is a button with a mini wooden candlestick painted to match. The bowl of handmade soaps is another button. The soaps are also made from polymer clay; a lot of translucent with a bit of beige and some cracked peppercorns. 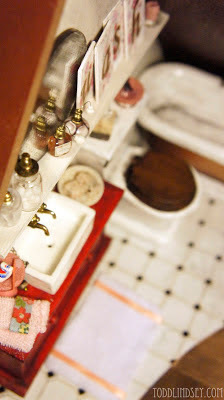 The shelf above the vanity is made from wood scraps. I got them in the wooden section with the dowel rods at Hobby Lobby. I just love all the goodies on that shelf! First off are two glass jars with Q-tips and cotton balls. The tutorial for those little ones can be found here. The mirror is from a broken compact. 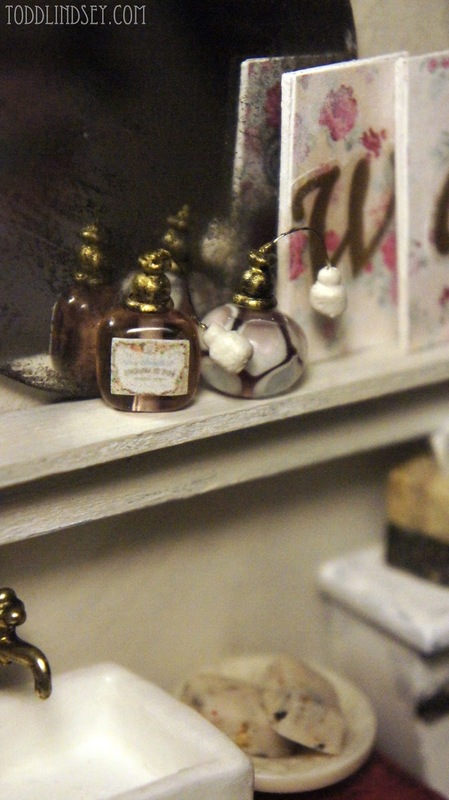 The perfume bottles are glass beads with bullet earring backs on top. I added a bit of thin jewelry wire and two seed beads on the end for the squeeze mechanism... or whatever that thingamajig is called. The label was just found on Google images. The WASH sign are from leftover roof shingles. I painted them and applied some floral scrapbook paper before distressing them a bit. The letters are scrapbook stickers. Super simple! 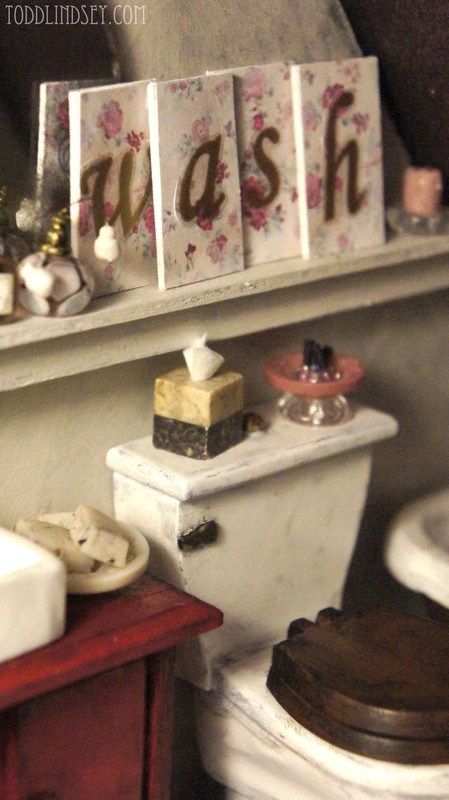 As for the rest of the elements on this side of the bathroom, the candle in the corner is made from polymer clay. There is a little wick in the top made from a small piece of dark gray wire. The glass candle dish is another button. The tissue box tutorial can be found here. (You won't believe how easy that one is!) 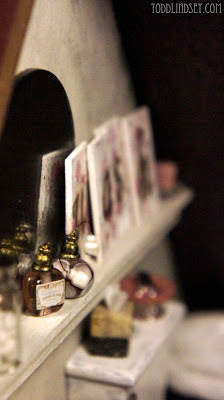 And the nail polish bottle tutorial can be found here. The stand holding the polish bottles are two buttons, stacked and glued. Speaking of that tub... I made a little shelf for it using this tutorial as a guide. I used paperclips and a piece of scrap wood. And of course, some more paint! The sponge is a piece cut from a real sponge. The sloped wall/ceiling is covered with sparkly, deep purple scrapbook paper. Yum. 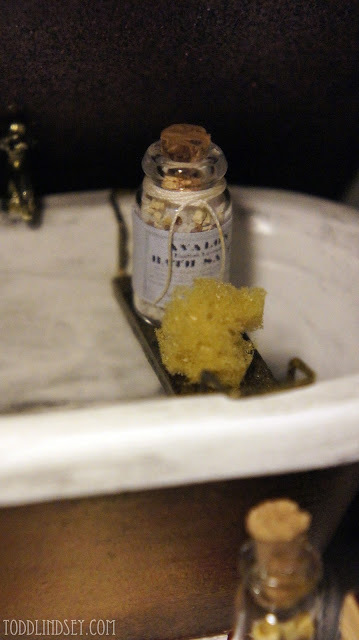 The bath salts are from a little glass container I got from Hobby Lobby. I filled it with a mixture of table salt and mini gravel. The label is from Google images and I just added some white thread around the top for extra detail. Sorry for the darkish photo... I really need that macro lens! The towels are also from baby washcloths, as aforementioned. 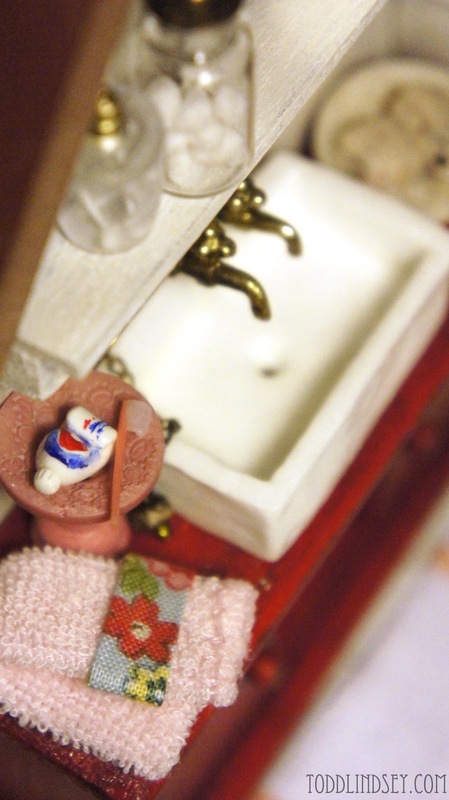 The towel rack is made from a toothpick with bullet earring backs on each end. 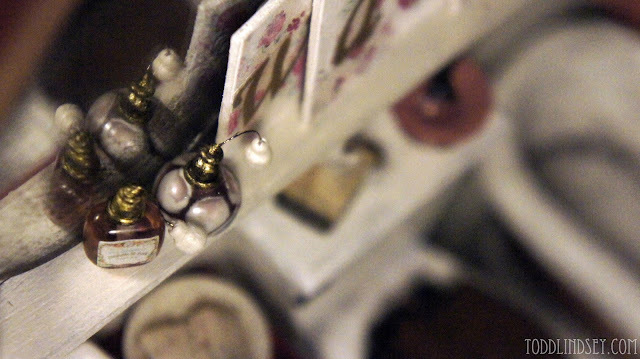 The rack is anchored to the wall with more earring backs and some jewelry headpins. The toilet paper roll is actual toilet paper wrapped around a piece of brown craft paper. The toilet paper holder is a piece of bent paperclip and two seed beads. the art above the towel rack is a three dimensional scrapbooking embellishment. I thought the bathroom needed just a little something extra. That's when I added the stool. The top of the stool is made from three extra roof shingles glued together. The legs are mini wooden thread spools found in the wood section at Hobby Lobby. 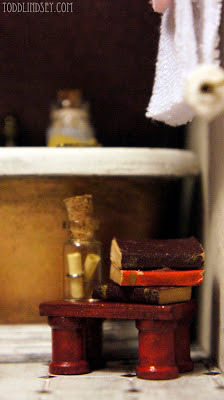 The books I had since I was little :) and the message bottle is a jewelry charm with the headpin removed. Now here is a picture purely for scale. 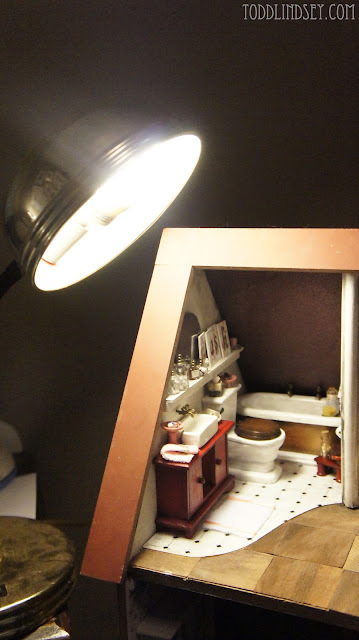 I hope you enjoyed my mini bathroom tour! Feel free to check out the rest of my dollhouse tutorials here. Have a happy week! 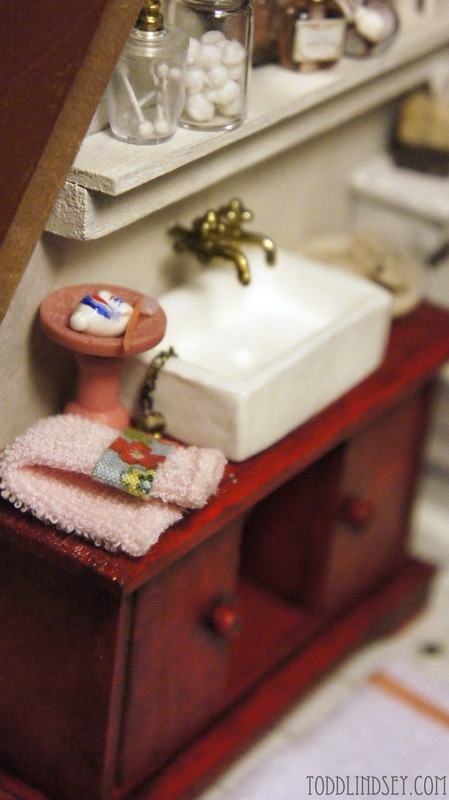 You have added wonderful details all around. It is absolutely awesome! What an amazing job and all of the beautiful details truly show off your artistic talents!!! A job well done lady!!! It's gorgeous! You really have thought of everything! I love the detail. This is amazing! I love miniatures. 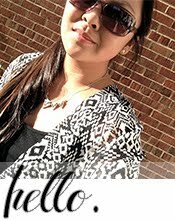 Hello Lindsey! 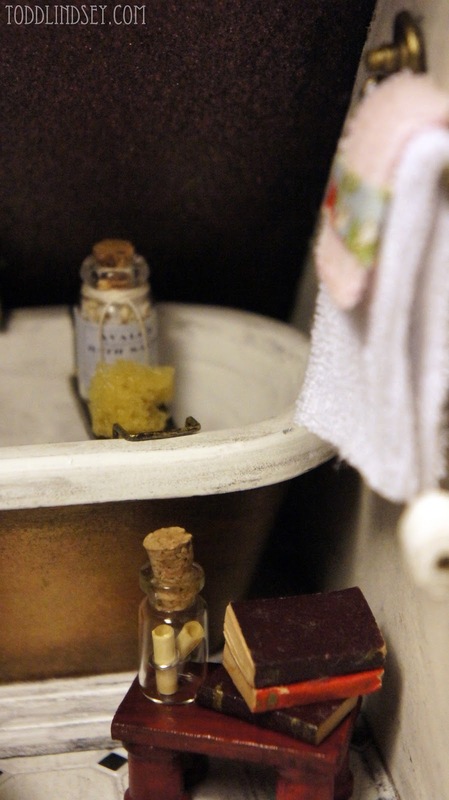 You have done a fabulous job of making the bathroom a really nice room to wash all the cares of the day away in! You have a very good eye for turning trash into real TREASURES! Great work! Hi Lindsey! You have done a fabulous job! I really love it all, great work! Completely in awe over here! Nice work!